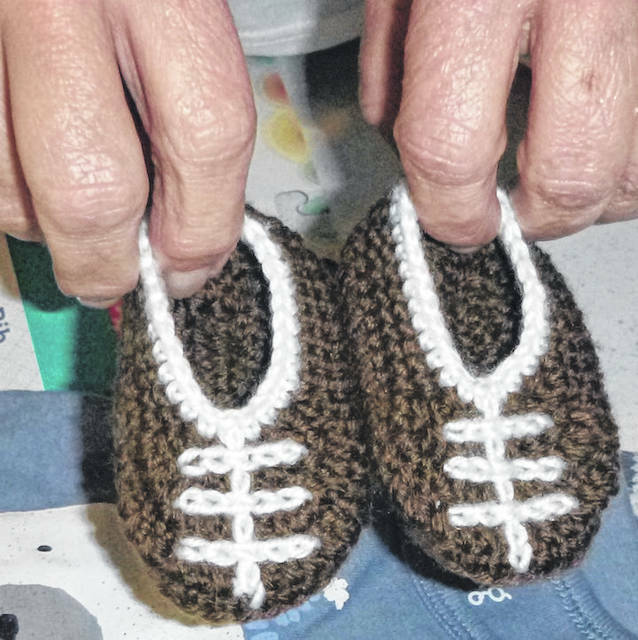 A tiny pair of slippers is among the items donated to Heartbeat of Morrow County. 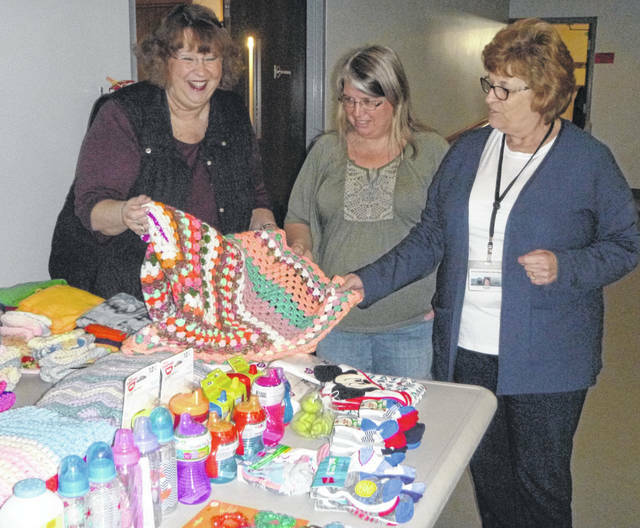 Faith Jagger of Heartbeat of Morrow County, left, sorts items with Maggie Ward and Executive Director Pam Eastep of Seniors on Center April 9. Items were collected and donated to Heartbeat. MOUNT GILEAD — Older generations helping younger ones is clearly illustrated by Seniors on Center assisting Heartbeat of Morrow County with a recent project. A table full of items included 18 handmade afghans, socks, hats, diapers, bibs, shampoo and other items. “These will go to young families in Morrow County who need them,” said Faith Jagger, chairman of the board of Heartbeat of Morrow County. Jagger said the Christian-based agency averages 10-12 clients per week, but it varies with seasons. “We have a boutique and moms with newborns through size 5 are able to get supplies. Many gently used items are free,” she said. This is the first year Seniors On Center collected items for Heartbeat, a pregnancy and parenting resource center. Pam Eastep, executive director of Seniors On Center, helped pack items. She said they were happy to help and serve as a collection point for the items. Heartbeat offers a variety of services for pregnant women and mothers of small children. “We help them with parenting skills, finances, nutrition, home management skills, all things someone out on their own for the first time needs,” Jagger said. The agency receives no grant funding and is dependent on volunteers, local churches, service clubs, businesses and individuals for donations. “We have a generous county. Our Walk For Life is our main fundraiser,” she said. Walk For Life is set for Saturday, May 11. Walk begins at 9 a.m. at Heartbeat of Morrow County, 712 Baker St., Mount Gilead. Heartbeat offers free, confidential pregnancy tests and referrals for medical help and other services, including peer counseling and prayer. The agency also advocates abstinence education and adoption resources. To contact Heartbeat call 419-947-9397. Hours of operation are Tuesdays 1-3 p.m. and 6-8 p.m. and Thursdays 1-3 p.m. Their 24-hour hotline is 419-947-7730.